Background Alexithymia is a multidimensional personality construct. Objective This study aims to investigate the neuronal correlates of each alexithymia dimension by examining the regional homogeneity (ReHo) of intrinsic brain activity in a resting situation. Methods From university freshmen, students with alexithymia and non-alexithymia were recruited. Their alexithymic traits were assessed using the Toronto Alexithymia Scale-20. The ReHo was examined using a resting-state functional MRI approach. Results This study suggests significant group differences in ReHo in multiple brain regions distributed in the frontal lobe, parietal lobe, temporal lobe, occipital lobe and insular cortex. However, only the ReHo in the insula was positively associated with difficulty identifying feelings, a main dimension of alexithymia. The ReHo in the lingual gyrus, precentral gyrus and postcentral gyrus was positively associated with difficulty describing feelings in participants with alexithymia. Lastly, the ReHo in the right dorsomedial prefrontal cortex (DMPFC_R) was negatively related to the externally oriented thinking style of participants with alexithymia. Conclusion In conclusion, these results suggest that the main dimensions of alexithymia are correlated with specific brain regions’ function, and the role of the insula, lingual gyrus, precentral gyrus, postcentral gyrus and DMPFC_R in the neuropathology of alexithymia should be further investigated. In recent years, an increasing number of brain imaging studies have been conducted to explore the neurobiological mechanism of alexithymia. Neuroimaging data supported that a high degree of alexithymia was associated with the dysfunction in specific brain regions, such as the medial prefrontal cortex, the anterior cingulate cortex, the insula and so forth.10–12 Unfortunately, data on these brain regions involved in alexithymia are still vague, and there are even many self-contradicting research results on the neurobiological models of alexithymia.13 14 This can be explained by several reasons. For these reasons, this study focused on the neural activity underlying the three main dimensions of alexithymic personality features. Furthermore, in this study, participants with depression or anxiety were excluded. To avoid the disturbance from various tasks, this study adapted the ReHo method to investigate the neural functional activity during resting state in the general population with alexithymia. All of the participants in this study were recruited from the freshmen of local universities, who took a mental health exam as part of the university entrance examination. The participants have to fulfil the following inclusion criteria: right-handed and physically healthy individuals without history of traumatic brain injuries, substance abuse or mental disorders. Participants were excluded if they have contraindications to MRI or had consumed any psychotropic medications within the 6 months before the study. Eligible subjects were randomly contacted through phone, provided written informed consent and effectively completed all of the psychological exams (see figure 1). Enrolment of cases and controls. According to the results of the psychological measurements (see Psychological measurements section, TAS-20>60, SDS<53 and SAS<50), 45 participants were recruited from local universities. The data of three participants were excluded from further analysis due to excessive head motion. There were 21 participants in the alexithymia group (Alex group) and 21 participants in the healthy control group (HC group). The status of alexithymia, depression and anxiety of these participants was assessed, respectively, by the Chinese version of the TAS-20, Self-Rating Depression Scale (SDS) and Self-Rating Anxiety Scale (SAS). TAS-20 is a 20-item self-report scale graded from 1 (strongly disagree) to 5 (strongly agree). Higher TAS-20 scores indicate a higher level of alexithymia. TAS-20 consists of three subscales: DIF, DDF and EOT. 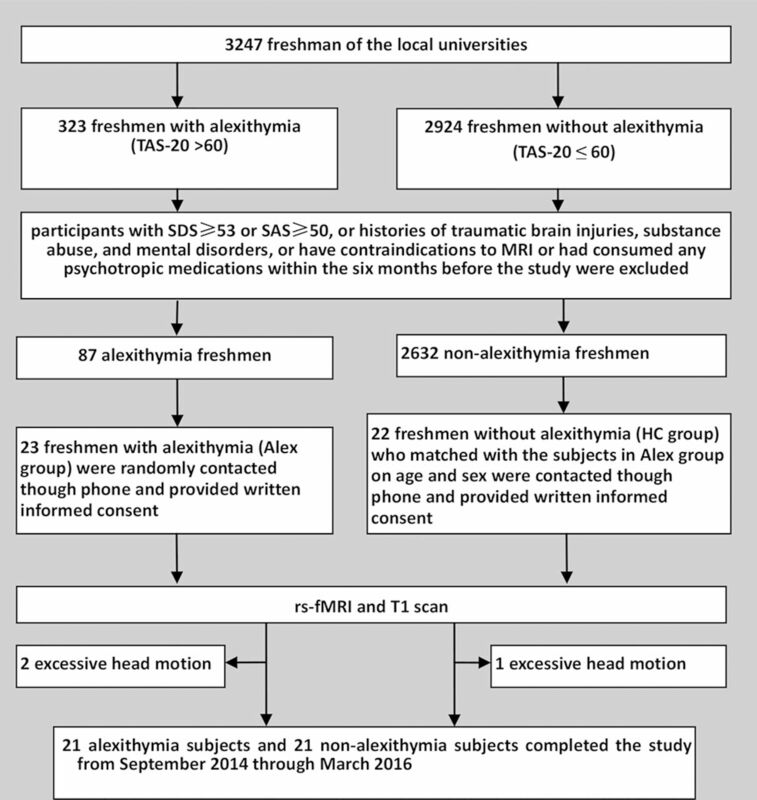 According to the recommendation of the developers of this scale, a TAS-20 total score>60 is clinically defined as alexithymia cases.22 Therefore, participants with a TAS-20 total score>60 were assigned to the Alex group and participants with a TAS-20 total score≤60 were assigned to the HC group. SDS and SAS both include 20 items, each graded from 0 to 3. Higher SDS/SAS scores are associated with more severe depression/anxiety. A gross score on the SDS/SAS is obtained by adding the scores of the 20 questions, and the standardised score is obtained using the integral part of 1.25-fold of the gross score. Subjective depression was defined as a standard SDS score ≥53. Subjective anxiety was defined as an SAS score ≥50. Therefore, all participants’ SDS scores must be lower than 53, while the SAS score must be lower than 50. All MRI measurements were performed with a 3T whole-body magnetic resonance imager (GE MR750) using a standard head coil. Foam padding was used for all subjects to minimise head motion. First, resting-state functional images were acquired (sequence=GREEPI, axial slices, scanning order= interleaved (1:2:43 2:2:42), slice number= 43, matrix size= 64×64, FOV= 220×220 mm, TR/TE= 2000/30 ms, FA=90°, slice thickness= 3.2mm, gap= 0 (voxel size 3.4×3.4×3.2), dummy scan= 0, number of acquisitions= 240, NEX= 1, parallel acceleration= 2, total scan time= 8’00’’). The subjects were instructed to rest with their eyes closed, not to think of anything in particular and not to fall asleep. For structural imaging, high-resolution three-dimensional T1-weighted anatomical images were acquired (sequence= SPGR, parallel acceleration= 2, sagittal slices, slice number= 180 with 2 slices in each end discarded (oversampling) to achieve 176, matrix size= 256×256, FOV= 256×256 mm, TR/TE= 8100/3.1 ms, FA= 8°, slice thickness= 1, gap= 0 (isotropic voxel size= 1×1×1), TI (prepare time)= 450 ms, bandwidth= 31.25 kHz, total scan time= 5’05’’). Based on Matlab V.2012a (MathWorks, Natick, Massachusetts, USA), data preprocessing was performed using DPARSF (Data Processing Assistant for Resting-State fMRI; http://rfmri.org/DPARSF) and REST (Resting-State fMRI Data Analysis Toolkit; http://www.restfmri.net).23 The first 10 images were excluded to ensure stability in the magnetic field. The remaining images were then corrected for slice-time differences and realigned for head motion correction. Data from subjects whose head motion exceeded 1 mm or for whom rotation exceeded 1° during scanning were excluded. We then coregistered the individual T1 images to functional images. Normalised data were resliced at a resolution of 3×3×3 mm3 and temporal band-pass filtering (0.01<f<0.08Hz). Functional images with linear trends were removed. Several sources of spurious variance (six head motion parameters, averaged signals from white matter, cerebrospinal fluid and global signals) were regressed out. The ReHo map of each individual was generated using DPARSF. The standardisation of ReHo was done by dividing the ReHo value in each voxel by the mean ReHo values of the whole grey matter. Then the standardised ReHo maps were smoothed with a 6 mm full width at half-maximum Gaussian kernel to reduce noise. The demographic data (except for gender) and TAS-20 scores of the Alex group and the HC group were compared by two-sample t-tests, which were conducted using SPSS V.19.0 statistical software and Excel. Differences were considered significant at a two-sided p value of 0.05 or highly significant at a p value of 0.01. The voxel-by-voxel-based ReHo comparisons between the Alex group and the HC group were performed with two-sample t-test using the REST software (p<0.01, AlphaSim correction, cluster size>20) without age and gender being regressed out because the participants of the two groups were close in age and gender ratio table 1). The Pearson’s correlation between the ReHo values extracted from the brain regions showing significant group differences and the three TAS-20 subscales’ scores within the Alex group was calculated (p<0.01). The analysis was conducted using the SPSS V.19.0 statistical software. Differences were considered significant at a two-sided p value of 0.05 or highly significant at a two-sided p value of 0.01. The demographic variables and TAS-20 global and three subscales’ scores (TAS-DIF, TAS-DDF, TAS-EOT) are presented in table 1. There were no differences between the Alex group and the HC group in terms of age or gender ratio. The TAS-20 total scores and three subscales’ scores in the Alex group were all significantly higher than those in the HC group. The results of the two-sample t-test revealed significant differences in the ReHo between the Alex and HC groups in several regions (figure 2 and table 2). Compared with the HC group, the ReHo values in the ventromedial prefrontal cortex (VMPFC), right dorsomedial prefrontal cortex (DMPFC_R), right middle frontal gyrus (MFG_R), bilateral temporal gyrus (ITG_L&R), right supramarginal gyrus (SMG_R), and precuneus were significantly higher in the Alex group. In contrast, the ReHo values in the insula, lingual gyrus, precentral gyrus, and postcentral gyrus were significantly lower in the Alex group compared with the HC group. Brain regions showing significant differences in ReHo between the Alex group and the HC group (p< 0.01, AlphaSim correction, cluster size> 20). Alex group, alexithymia group; DMPFC_R, right dorsomedial prefrontal cortex; HC group, healthy control group; ITG_L or R, left or right inferior temporal gyrus; MFG_R, right middle frontal gyrus; ReHo, regional homogeneity; SMG_R, right supramarginal gyrus; VMPFC, ventromedial prefrontal cortex. The results of the correlation analysis suggested that the TAS-DIF scores were positively associated with the ReHo in the insula (r= 0.52, p= 0.016) (table 3). The TAS-DDF score was positively and significantly associated with the ReHo in the lingual gyrus (r= 0.45, p= 0.043), precentral gyrus (r= 0.73, p= 0.002) and postcentral gyrus (r= 0.45, p= 0.040) (table 3). For the TAS-EOT score, the results indicated that the TAS-EOT scores were negatively correlated with the ReHo in the DMPFC_R (r= −0.53, p= 0.014) (table 3). The present study examined the neuronal activity synchronisation in various brain regions of participants with alexithymia during a resting baseline. ReHo reflects the changes in the temporal feature of intrinsic neuronal activity.21 The comparative analysis indicated that significant group differences in ReHo were observed within multiple brain regions in the frontal lobe, parietal lobe, temporal lobe, occipital lobe, and insular cortex, including VMPFC, DMPFC_R located in the prefrontal lobe; MFG_R and precentral gyrus located in the frontal lobe; bilateral ITG located in the temporal lobe; SMG_R, precuneus and postcentral gyrus located in the parietal lobe; insula; and the lingual gyrus located in the occipital lobe. Most of these brain regions play an important role in perception, motor control, self-awareness, cognitive function, emotion experience and expression, suggesting the pathology of alexithymia involved in many brain functions. It explains why alexithymia is a multifaceted personality construct. It is notable that alexithymia is often accompanied by depression and anxiety, and by other mental disorders. These comorbidities confound the symptoms of alexithymia. Consequently, the significant group differences in ReHo were examined in many brain regions, which may not be associated with the development of alexithymia and might be involved in the comorbidities of alexithymia. Therefore, the present study’s correlation analysis indicates that only DMPFC_R, insula, lingual gyrus, precentral gyrus and postcentral gyrus are associated with the three dimensions of alexithymia. The present study suggests that abnormal activity in the insula was positively associated with the TAS-DIF level in individuals with alexithymia. The insula (also called the insular cortex) is a portion of the cerebral cortex folded deep within the lateral sulcus. The insula is commonly believed to be involved in emotions. Additionally, the insula is linked to the functions of interoceptive awareness, self-awareness and social emotions, which include interpersonal experience and empathy processing.24–27 The TAS-DIF level indicates the capacity for internal emotional feeling identification, which involves interoceptive awareness, self-awareness, and emotional processing. Previous neuroimaging research had supported that a high degree of alexithymia was associated with a dysfunction in the insula.10 This study demonstrates the important role of the insula in the neuropathology of deficits in identifying feelings seen in alexithymia. In the present study, the TAS-DDF score of individuals with alexithymia was positively associated with the ReHo in the lingual gyrus, precentral gyrus and postcentral gyrus. The TAS-DDF level presents the capacity for describing internal emotional feelings. The precentral gyrus is located in the dorsal portion of the frontal lobe. It is the primary region of the motor system which plans, controls and executes voluntary movements. Animal research suggested that the precentral gyrus may participate in integrating muscles in meaningful ways rather than in segregating the control of individual muscle groups.28 The lingual gyrus is located in the bottom part of the occipital lobe. Lingual gyrus activation has been linked to processing visual information and encoding visual memories.29 30 The postcentral gyrus is a part of the parietal lobe and behind the precentral gyrus. It is the main sensory receptive area for somatosensory information. Suslow and colleagues31 suggested that the somatosensory cortices were known to be critically involved in the processes of emotional mimicry. Humans express emotional feelings mainly through speaking, facial expression or body movement. Previous research had supported that facial somatosensory/motor activity can play a role in how faces are processed.32 Therefore, it is reasonable to infer that the TAS-DDF levels are involved in the lingual gyrus, precentral gyrus and postcentral gyrus. For the TAS-EOT level in participants with alexithymia, the results of the present study indicated that ReHo in the right DMPFC was negatively associated with alexithymia. DMPFC is located in the mid-dorsolateral part of the prefrontal lobe. Isoda and colleagues33 reported that DMPFC was involved in the ‘theory of mind’ or considering the mental states of other peoples. In recent years, many studies have emphasised the relationship between alexithymia and the ‘theory of mind’.34 35 The TAS-EOT level presents the externally oriented cognitive style of thinking in people with alexithymia. 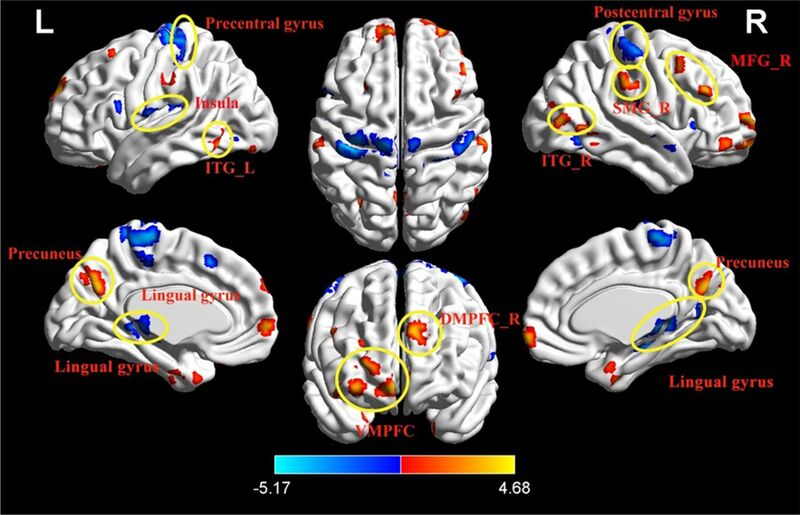 Additionally, DMPFC has been demonstrated to play an important role in various complex cognitive processes, such as social cognition, acquisition of goal-directed behaviour, devaluation of the outcome and resolving conflict.36–38 According to these previous reports and the results of the present study, the right DMPFC should play an important role in the development of alexithymia and is especially involved in the EOT of people with alexithymia. Regretfully, the number of subjects with alexithymia was limited in the present study. In order to better understand the roles of these three brain regions in the development of the three main features of alexithymia, a further investigation recruiting more subjects is necessary. In conclusion, this study examined the neuronal activity in persons with alexithymia and analysed the relationship between the three dimensions of alexithymia and neuronal activity in specific brain regions. This study suggested that the three dimensions of alexithymia were linked to different brain regions (including insula, right DMPFC, lingual gyrus, precentral gyrus and postcentral gyrus) separately. The functional alteration of these brain regions in persons with alexithymia should be further investigated for a more complete understanding of the neuronal mechanism underlying alexithymia.
. Disorders of affect regulation: Alexithymia in medical and psychiatric illness. Cambridge, UK: Cambridge University Press, 1997. Contributors HD designed the study, managed the imaging data selection and analysis, and wrote the first draft of the manuscript. LM, MM and SX undertook the psychological measurements and statistical analysis. All authors contributed to and have approved the final manuscript. Funding This work was supported by the Natural Science Foundation of Zhejiang Province (no Q14H090014). Ethics approval All of the protocols were approved by the Research Ethics Review Board of Hangzhou Normal University. Provenance and peer review Not commissioned, externally peer reviewed.